Well before such latter-day rarities as the 1913 Liberty nickels, the 1894-S Barber dimes, or the 1907 Ultra High Relief double eagles, the 1804 silver dollars were acknowledged as the most famous U.S. coins, yardsticks by which great American numismatic collections were measured. Acquisition of an 1804 silver dollar-especially an Original or Class I example-bestows immediate numismatic immortality upon its possessor. The Class I Originals were legitimately struck in proof format at the U.S. Mint, apparently intended for presentation to foreign dignitaries. Some, however, soon found their way into commercial and collector channels. Their long and illustrious pedigrees have names tying them to foreign royalty, exotic destinations, captains of industry, and the luminaries of U.S. numismatics: the King of Siam, the Sultan of Muscat, Joseph J. Mickley, Matthew Stickney, Louis Eliasberg, John Work Garrett, Col. E.H.R. Green, Lorin G. Parmelee. 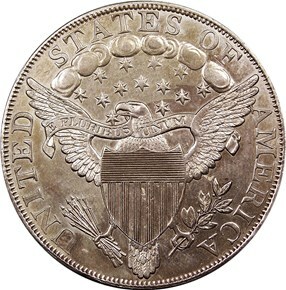 The first 1804 silver dollar to reach collectors' hands is also the first-and most famous-numismatic transaction that most American collectors know of: In 1843 collector Matthew Stickney traded the U.S. Mint a unique 1785 Immune Columbia cent overstruck on a 1775 British gold guinea, along with some other pieces, for an 1804 silver dollar. The Guide Book of United States Coins (Red Book) has included the story since its first edition was published in 1947, edifying generations of young U.S. collectors and providing the stuff of dreams. Class I 1804 silver dollars have regularly set one coin auction record after another over the last century and a half. The present Mickley specimen brought the staggering sum of $750-a record for the entire 1860s-when legendary collector William A. Lilliendahl bought it from the 1867 W.E. Woodward sale. The second-highest auction price of the decade, from the same sale, was 'only' $340 for an 1802 half dime, one of the most coveted American coin delicacies. Class I 1804 dollars appear regularly in the top auction records for the ensuing decades, according to a March 2008 Coin Values compilation by P. Scott Rubin. Three of the top four auction records in the 1870s are for Class I 1804s-the first, second, and fourth spots. After the Class III Restrikes made their appearance around 1876, the Adams Class III Restrike sold by John Haseltine set the third-highest auction price for the decade. In the 1880s the Chapman Brothers sale of the Dexter specimen marked the first time that a Class I 1804 dollar-and likely any other U.S. coin at auction-crossed the $1,000 threshold. The trend for 1804 Class I Originals to break auction records continued. In 1890 the Parmelee specimen sold for $570, second for the entire decade only to the $900 that an incredibly rare 1822 half eagle (one of three known) brought. In 1907 the Stickney specimen took top honors for the 1900s, selling for $3,600. 1804 silver dollars marked new auction records all the way through the 1980s as prices rose steadily, first to five digits in the 1960s, then to the upper six-digit range by 1989, when the Dexter Class I Original sold for $990,000. More recently the prices for these most regal and renowned U.S. coins show no signs of slowing: In 1999 the fabulous Sultan of Muscat-Brand-Childs 1804 Class I silver dollar, the finest known and graded PR68 by PCGS, realized $4,140,000-a record price for a U.S. coin, one that stood for nearly three years and then exceeded only by the 1933 double eagle that sold in 2002 for $7,590,020. The 1804 silver dollar has been the object of intense desire among American collectors for more than 150 years. Before the 1894-S dimes were struck, before the 1913 Liberty nickels appeared, and before President Franklin Roosevelt?s gold recall set the stage for the 1933 double eagle to become America?s most controversial coin, numismatists coveted the 1804 dollar. As a silver coin, it was a worthy collectible in the eyes of mid-19th century numismatists-an unparalleled challenge among American issues. In his 1999 volume The Rare Silver Dollars Dated 1804 and the Exciting Adventures of Edmund Roberts, Q. David Bowers wrote that soon after numismatics as an organized discipline blossomed in America in the late 1850s, collectors gravitated to certain issues: ?By the early 1860s, specialists in the United States series were prepared to give the proverbial eyetooth for a splendid 1793 cent, or 1802 half dime, or 1804 silver dollar. By 1867 the 1804 silver dollar had become America?s most famous, most discussed, most talked about rarity.? The Crowning of 'The King'-Most Famous and Publicized U.S. Coin Precisely when America's foremost coin garnered the accolade of ?King? is lost to time. Two 1885 auction descriptions, however, set the latest limit. One notes that the usage had been around for at least a few years, suggesting an origin somewhere between the close of the Civil War and 1880. What is certain is that the "King of American Coins" earned its title well before it had serious challengers. In the years since, the legend of the 1804 dollar has only grown. Even the Guide Book, which gives no special mention to the 1894-S dime and only a slender paragraph to the 1913 Liberty nickel, devotes a full page to what the 2008 edition describes as ?one of the most publicized rarities in the entire series of United States coins.? The 1804 dollar is more than highly publicized, though. Rather, it is famous. For every nationwide numismatic advertisement, there have been thousands of casual notices, such as stories old-timers swap at local coin clubs about seeing an 1804 dollar in a museum. The 1804 dollar has attracted more scholarly attention than any other issue. They are the focus of countless articles, presentations, and even entire books, among them the seminal 1962 The Fantastic 1804 Dollar by Eric P. Newman and Kenneth Bressett, and the Bowers reference already cited. The silver dollars dated 1804 have been displayed at various exhibitions including Las Vegas, Boston, Philadelphia, Colorado Springs, New York City, and Washington, D.C. As prices rose, so did media attention. When 1804 dollars sold in recent years, people worldwide learned of it on their local news. Although numismatists know of only 15 1804 dollars today, their lore has reached tens of thousands of collectors who have entertained dreams of someday seeing (or owning) an example. The 1804 dollars possess an unmatched mystique, combining legendary names of the past with absolute rarity. For all the questions surrounding the 1804 dollar in its various incarnations, it remains a numismatic icon. 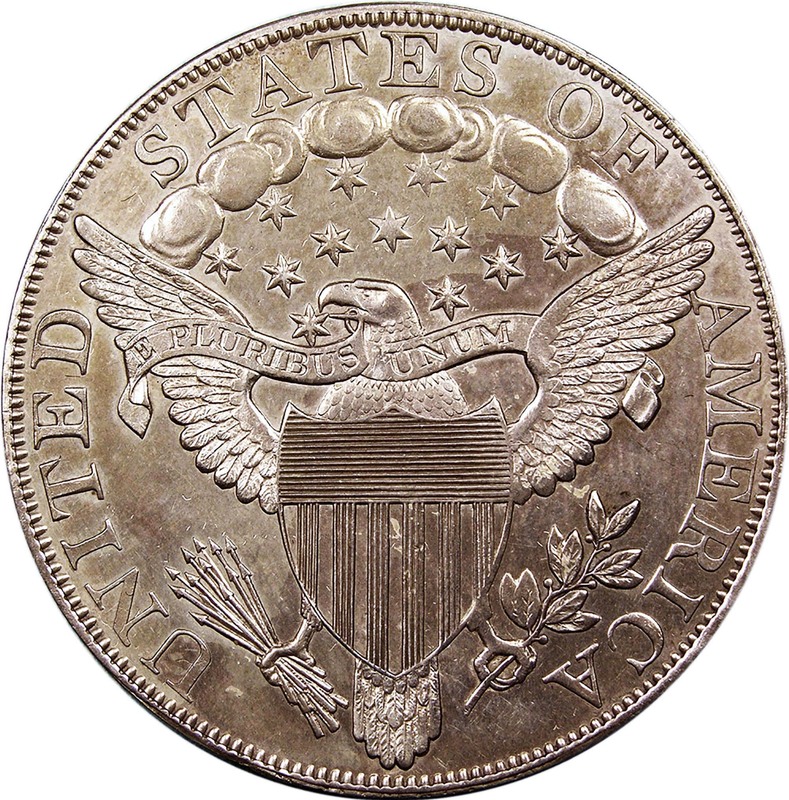 Even though a handful of U.S. coins have smaller mintages or fewer known specimens, each 1804 dollar in the three classes-15 in all-is extremely rare. The Newman-Bressett Class I coins, corresponding to the ?originals? in other references, number only eight pieces, while only six Class III examples (?restrikes?) are traced today. The Class II, ?plain-edged restrike,? is known only through history and a single surviving specimen in the Smithsonian, and as such is noncollectible. Several Class I pieces are similarly inaccessible to eager potential buyers. Among the eight Class I dollars, just five are in private collections, with three in institutions due to the Byron Reed bequest of the Parmelee example to the City of Omaha, the Mint Cabinet-Smithsonian piece, and the Du Pont donation of the Cohen coin to the ANA. Three of the six known Class III examples are also unobtainable: the Linderman-Smithsonian specimen, the Idler-ANA coin, and the ANS-Ellsworth piece. Such donations allow numismatists to see multiple examples of the famous 1804 dollar, while simultaneously complicating their efforts to own one. Museums have been known to divest themselves of coins-the present Mickley-Hawn-Queller piece was sold on behalf of the Massachusetts Historical Society after 65 years at that institution-but it is highly unlikely that an organization of national importance, such as the Smithsonian or ANA, would sell an 1804 dollar. Certain U.S. issues are known to have smaller surviving populations today. The mysterious Liberty nickels dated 1913, the 1885 Trade dollar proofs, and the singular 1870-S half dime and three dollar gold are examples. Still, as previously noted, the 1804 dollar was well-recognized as a rarity before any of those coins were struck. Numismatists of the 19th century knew of fewer examples than do contemporary numismatists. The Mint Cabinet, Stickney, and Mickley specimens were at the forefront of collectors? minds in the mid-19th century, but the King of Siam piece was a mid-20th century revelation, one that caught even Eric Newman and Kenneth Bressett by surprise as they wrote The Fantastic 1804 Dollar. The scandalous debut of the Class II pieces led their creators to keep the clandestine Class III coins off the market until at least the early 1870s. 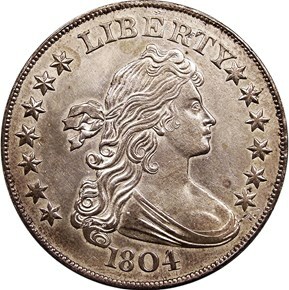 The emergence of new examples did not negatively affect prices or the passion of collectors for the 1804 dollar. While the academic side of numismatics has sometimes harshly criticized the pieces in general, the 1804 dollars have never lacked willing buyers. In the 21st century collector enthusiasm has flourished for these famous, important numismatic delicacies.